Yes, it is, RUNNING MAN! Enough with the cheesy and boring opening, shortly I will present you my own list of Running Man best (and top and memorable and funniest) episodes especially in 2010. Why did I bother making it, you may ask? Well, firstly I enjoy watch and rewatch every single episode of it. There are so many I will never get bored hahaha. And because I like to read, I automatically love to browse anything RM related. I usually search for Spartace (my OTP, sorry for the fellow Monday Couple shipper hehe) and best Running Man episode. I really like reading these lists so I can find what episode to rewatch at that time of the day, that's why I really appreciate people who take their time to write it on the internet. I'm deeply entertained by your effort, people! Thank you! And here comes the time when I also want to contribute to the society in the same way. There goes my reason for this list. I divided my favorites by year so it's easier for me to choose among many episodes. This one just can’t be missed. The games are all RM fun (modified hide and seek and a leisure tea time, these two are classic and fan’s all time favorites). And the little talks here and there, including the fuss about Jong Kook’s team at the opening and pre Monday couple moment. Peaceful Gary strikes too! :D This episode also has one of my favorite guests ever, Lee Joon, who’s almost as babo as Kwangsoo haha. And of course, as the title says, members' embarassing videos are the highlight! Another things I like about this episode : Cha Tae Hyun (the guest; an hilarious actor and also happened to be Jong Kook's best friend), the location (yours truly here lovessss contemporery art so much hehe), and the games (especially modified hide and seek and drawing game). This episode has its fun moments. Not grand, just fun. 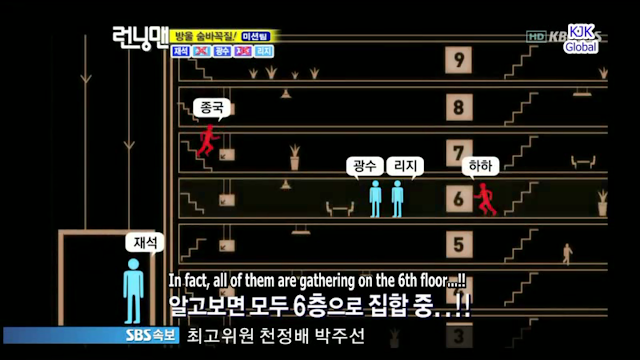 First thing first, this is the first episode with the fixed 8 members, without a guest. So finally we can focus on their roles and comedy antics. The games are all fun. Hide and seek under the heavy rain? Check. Catch The Thief with a twisted ending? Check. Even the normal quiz game could be THAT FUNNY on this episode. 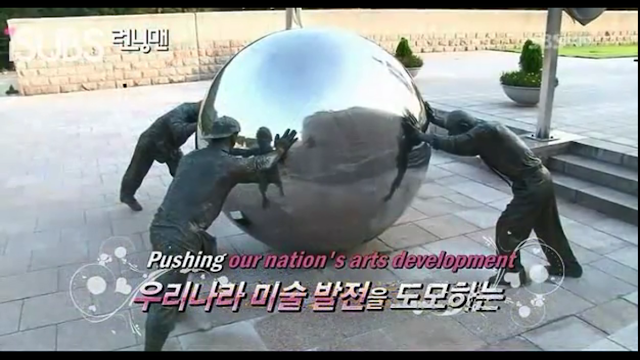 This episode is what classic Running Man is all about! I don't think I need to give detail description because you really need to watch it for yourself. The small moments, the unexpected twist. Everything is just funny and hilarious. These screen caps are only the tip of its iceberg of hilariousness. Must watch episode. There are two definite reasons why I love this episode. Ummm, okay, maybe three. First is the guest. Super Junior Siwon and Kim Min Jong are already unique in their own way, and RM member luckily and perfectly sensed it. Their harmony and synchronization is so fun to watch and very GIF-material. From Siwon’s prince style to Min Jong’s clumsiness. Second reason is the location. A mission in the big toy shop and another one in a spacious supermarket? Major yayness. So much to see and all the colors are so refreshing (or maybe this is just my personal opinion :P). And finally the additional reason : the theme. I always love Christmas thingy even though I'm not a Christian myself. There are something soothing and peaceful seeing Santa Claus and hearing carols. And this episode has everything that fit in perfectly with the theme.